Jackie Robinson wasn’t the first black player in the major leagues. Before Jackie Robinson there was Fleet Walker. 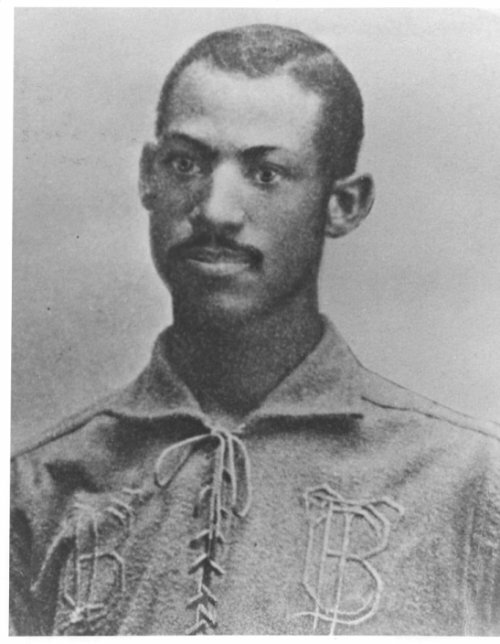 When the Toledo Blue Stockings jumped from the Northwest League to the American Association in 1884, catcher Moses Fleetwood Walker became the first African American player in the major leagues. Walker was born to a white mother and black father in 1857 in the small town of Mount Pleasant, Ohio, an important stop on the Underground Railroad. His father worked as a barrel maker and later became his town’s first black doctor. Walker starred as the catcher for Oberlin College’s baseball team, graduating in 1881. The following year, he enrolled in law school at the University of Michigan, where he also played for the baseball team. The Blue Stockings joined the American Association in 1884, then considered one of the major leagues, and Walker played 42 of the team’s 104 games. Walker never played in the majors again. He worked on multiple occasions as a postal clerk and continued playing minor-league ball until the color line ended his career in 1889. The last team he played for was in Syracuse and he stayed in town after, working as a baggage handler for a railroad. In Syracuse in 1891, he was charged with murder after stabbing a man in a street fight. Walker didn’t deny killing the man, an ex-convict named “Curly.” He said he was acting in self defense after being taunted with racial slurs and pelted with rocks. A jury of 12 white men took just three hours to find him not guilty. The trial was turned into a play put on by the Black Ensemble Theater in Chicago last year. In his later years, Walker became active in the civil rights movement. He and his brother Weldy, who played five games with the Blue Stockings, started a newspaper focused on black issues. He died in Cleveland in 1924 at age 67. Last month, a bill seeking to designate October 7 as Moses Fleetwood Walker Day passed the Ohio House of Representatives.